The B.A. in the Department of Religious Studies is a research, analytic, and writing intensive program that features close work with faculty in small classroom settings. It seeks to develop a foundational knowledge of the world’s diversity of religious cultures and critical awareness of the ways in which religion shapes how we see and act toward ourselves, others, and the environment around us. Through the study of specific religious traditions and settings, students come away with a background that is invaluable to understanding and working with people of other cultures, whether in international business or simply as an informed global citizen. Through hands-on training in research and academic writing, students also acquire substantial communication and critical thinking skills that translate easily into most any profession. 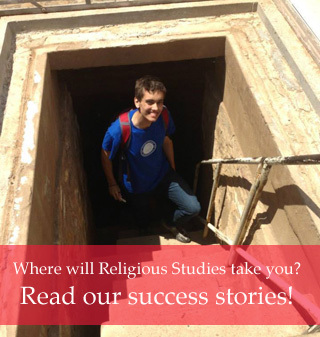 As a department that encompasses multiple disciplinary and area studies expertises, we share synergies with units across the university that allow students to nurture all manner of specialized interests when it comes to the study of religions, from pan-regional traditions to localized indigenous religions, from gender, ritual, and material religion to textual studies. Close work with faculty in small classroom settings. Develop understanding of the world’s religious traditions, and the impact of religion on cultural, social, and political issues, present and past. Gain knowledge essential to professions in which one works with persons of other cultures, and critical to being an informed citizen in an increasingly globalized world. Sharpen critical thinking and communication skills valuable in most any profession.